The premise of today’s post came to me last Tuesday, as I hiked through the foothills just to the west of Denver. My ears still had a very slight ring to them from the previous night’s Jason Mraz concert, but I still felt the need to stay immersed in his music. Having all three major CDs and a few EPs on my iPod, I started up the Mraz Mix and took off into the woods. Unlike a lot of my hikes, this one really didn’t have the sweeping mountain views. Instead, I plunged into the wooded trail, and apparently dislodged some deep angst that floated up to the surface. I’ve been pretty up-front so far about how my life has changed over the past few months, and how music has played a big role in adapting to those changes. A decent chunk of my time over the past month has been fretting about current situations, as well as future predicaments. I’m a planner at heart, and the uncertainty of my financial and residential situations throws me for a loop. Somewhere along the line you have to let go of those worries and allow life to develop as it will whether you worry or not. I recognize this, but in my case, that is much easier said than done. Mraz was in fine voice throughout the show, and his sense of humor was on display all night. “You and I Both”, which contains some of the highest notes that he hits in any song, was even better than the studio version. That’s the joy of an artist like Jason; his element is in the live performance, and he definitely exceeds any expectations that someone seeing him for the first time might come in with. Group participation is also encouraged, as evidenced by the choreography he set up for “The Dynamo of Volition”. Dancing is encouraged, sing-alongs are practically mandatory, and knowledge of more than just the hits is highly encouraged. You like cover songs? We’ve got cover songs! 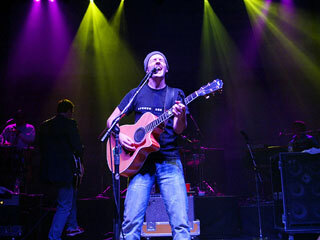 Besides the Marley track, Jason rocked Steely Dan’s “Peg”, and kicked out a rousing version of “Buttercup”. Honestly, I didn’t realize just how many words I knew to that before Monday night. My favorite cover, however, was during “The Remedy”, where Jason had the ladies sing a portion of the song, while the guys sang the first verse of “Wonderwall”. Don’t ask me to explain why, but it was absolutely amazing. Jason’s band was also top-notch. Referred to at one point as “Child Support and the Saran Wrap Jimmy Hats”, they were as tight a group as I’ve seen. At one point, the horn section ended up in the balcony, playing to the masses. It was clear to the audience that these guys really like each other, which made the show that much more enjoyable. I’ve seen four shows in the past two weeks, but this show was far and away the best one. Maybe it’s a case of right place, right time that the themes of Jason’s music resonated with me as well as they did. Perhaps it’s being in the middle of a crowd that’s been with this guy for the past five years, and really gets the music. Whatever the reason, I was caught up in the wave, and there was nothing that could stop it. Show ender “A Beautiful Mess” really summed it all up for me. “Hold your own/Know your name/Go your own way”. That’s the best advice I’ve gotten in a long time, and it’s something I plan to follow whenever possible. Jason is definitely one of my top 5 male singers of all time. Live High is one of the euphoric highlights of his album. He did something similar with the downbeat but marvelous Life Is Wonderful from his last set. And dude knows how to rock out a cover version. Several have been committed to studio recordings over the years but definitely my faves are Rainbow Connection, Melt With You and Summer Breeze. Man can do no wrong. Glad you had fun at the concert. Sounds like you had a great time and that Jason put on an awesome show. Great read! I SO sympathize re home and money changes. My year began that way and it was terrifying. I am still, 9 mos on, not totally chilled, but I am better. I opted to go with some big changes to what I’d known before and I’d say not only was it good for me, but I ended up better off. Knock wood! Paul, agreed on all points, but most especially the covers. “Peg” was just amazing, and I had a blast with “Buttercup”. I didn’t like “Rainbow Connection” as much, but it’s tough to hate that song, ya know? Yuri, I highly recommend it if you get a chance to go. XO, thanks for the sympathy. I know it’s all going to work itself out, but you just have to make it through the rough spots on the way to smooth sailing.